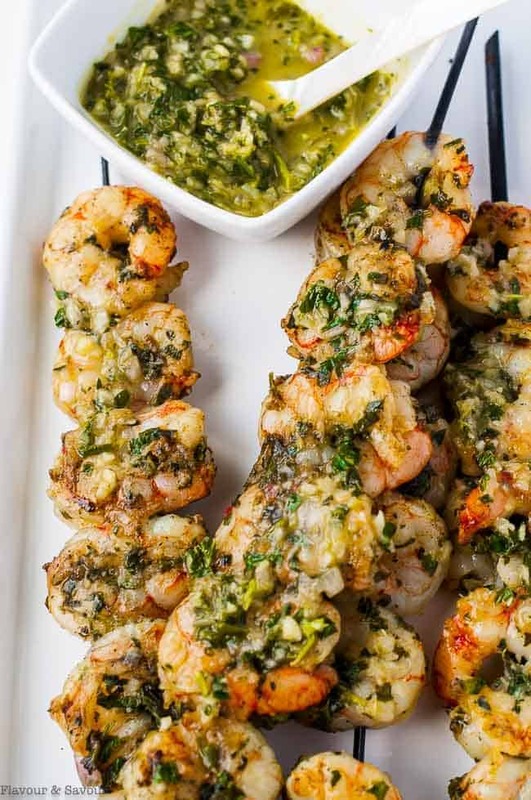 These 10 Minute Grilled Chimichurri Shrimp Skewers are loaded with bold fresh herb flavours from easy-to-make Chimichurri sauce. 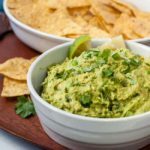 A low carb, keto and paleo and Whole30-friendly recipe. 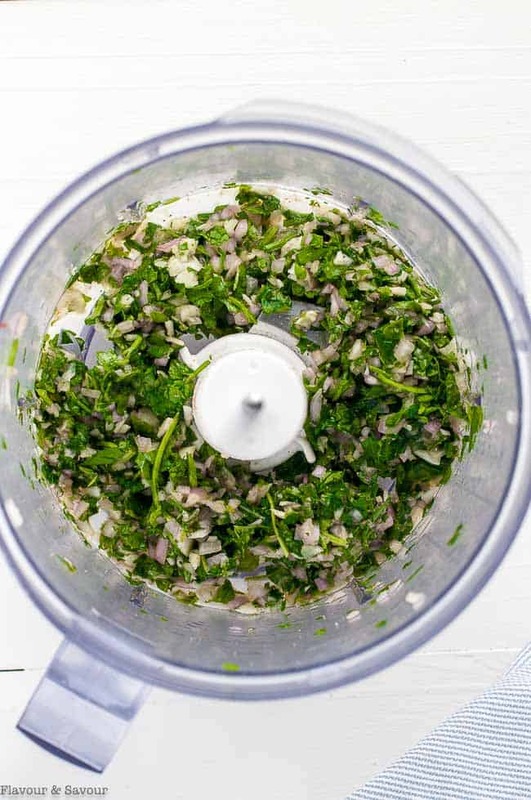 If you’ve never made Chimichurri Sauce, there’s no time like the present. 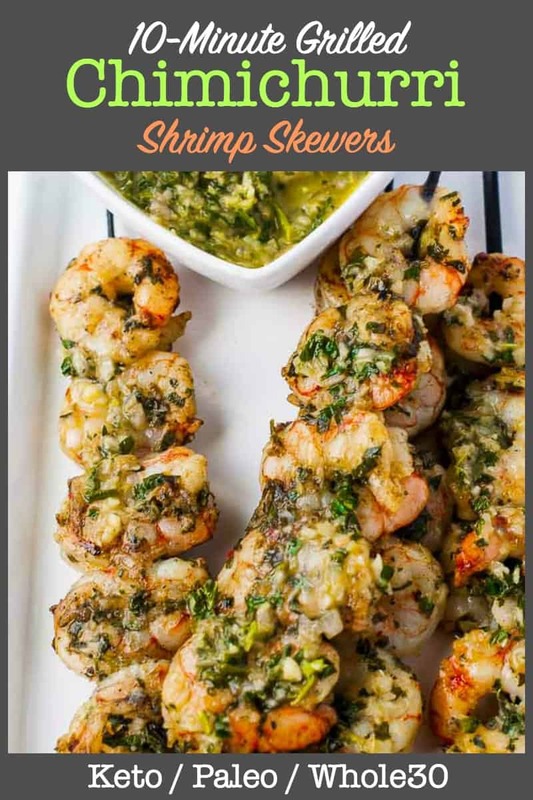 And one of my favourite ways to serve it is these Grilled Chimichurri Shrimp Skewers that can be ready in ten minutes! There’s something about grilling food on a stick that makes preparing dinner fun! I’ve been making these Ginger-Garlic Glazed Korean Chicken Skewers and these Easy Japanese Chicken Yakitori Skewers on repeat lately. But today, I opted for shrimp with Chimichurri instead. 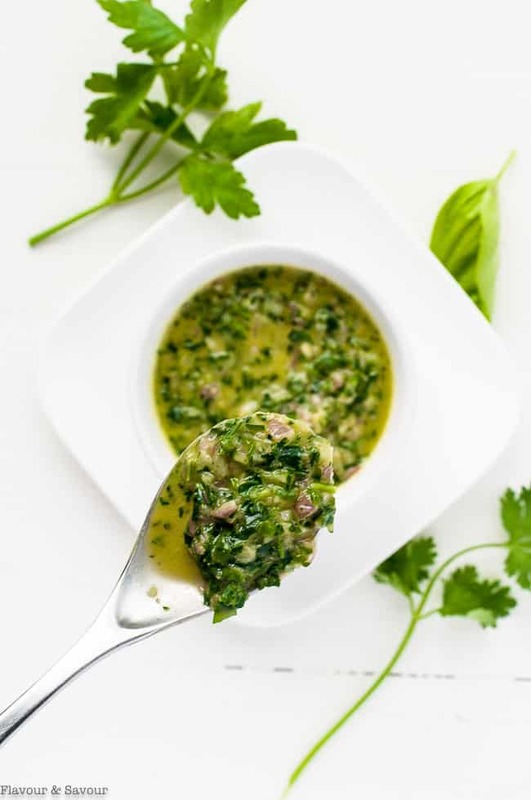 Chimichurri Sauce has its origins in Argentina. It’s often served as an accompaniment to grilled meat, especially beef or pork. I love it on chicken too, as in this 30-minute Chimichurri Chicken Dinner Salad. We like it with seafood, as well. Its bright bold flavours pair well with shrimp, scallops, salmon and any white fish. It packs a punch of flavour! Best of all, it is so simple to make! 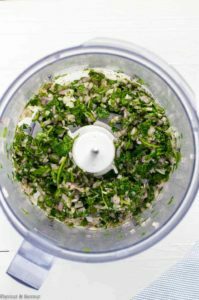 Traditionally, Chimichurri sauce was made by crushing fresh herbs with a mortar and pestle but a food processor makes it so much easier. 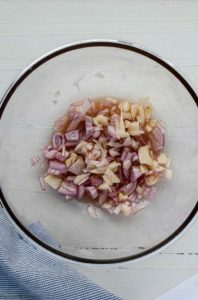 Start by marinating roughly chopped garlic and shallots in a little red wine vinegar and fresh lemon juice, just until you’ve set up your food processor and assembled the remaining ingredients. Then add the herbs, seasonings, garlic and shallots to the food processor and pulse until roughly chopped. With the machine running, drizzle in olive oil until emulsified. That’s it! 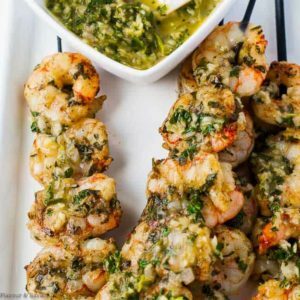 Your Chimichurri sauce is ready to toss with shrimp. Like it spicier? Add crushed red pepper. Save some in a small dish to brush on the shrimp as it cooks and to serve alongside your meal. Thread your wild-caught shrimp on skewers and grill for two minutes per side or just until no longer translucent. 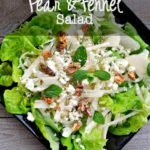 Serve with a hearty salad or garden veggies. Enjoy! 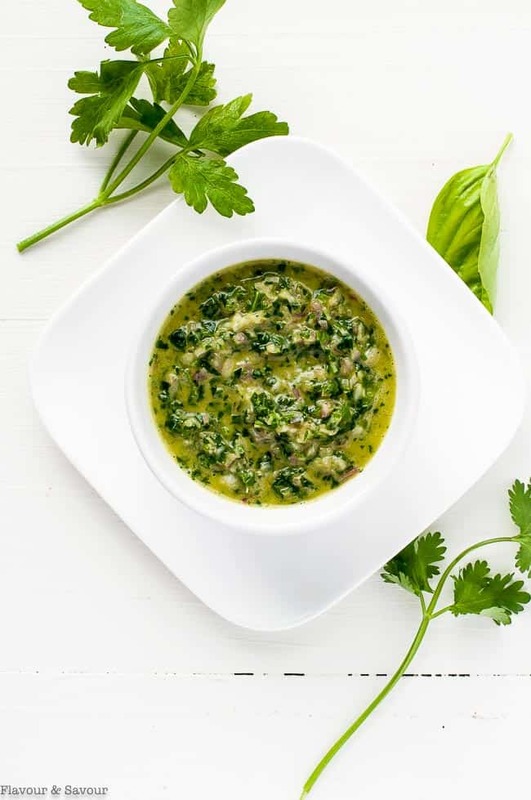 How long will this Chimichurri Sauce keep? Stored in a tightly covered container in the refrigerator, this sauce will last up to a week. You can also freeze it for up to a month. Don’t you love 10-minute low-carb recipes like this one? Let me know in the comment section below if you make this recipe! I love to see what you make. 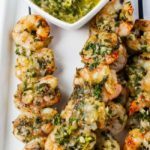 These 10 Minute Grilled Chimichurri Shrimp Skewers are loaded with bright fresh herb flavours from easy-to-make chimichurri sauce. 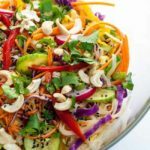 A low carb, keto and paleo-friendly recipe. Roughly chop garlic and shallot. Combine with red wine vinegar and lemon juice and set aside. 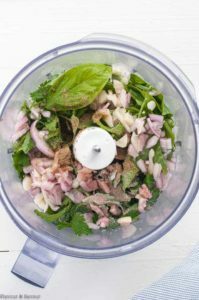 Add parsley, basil, cilantro, coriander and salt to the bowl of a food processor. Pulse to roughly chop. Add garlic and shallot mixture. With machine running on low, slowly add olive oil in a thin stream until well-incorporated. Take care not to chop too finely. The Chimichurri sauce should be slightly chunky. Taste and adjust seasoning if necessary. Save some in a small dish to brush on the shrimp as it cooks and to serve alongside your meal. Toss the remainder with the shrimp. Thread shrimp on skewers and grill for two minutes per side or just until no longer translucent. Serve with extra sauce on the side. Store tightly covered in the fridge for up to a week. 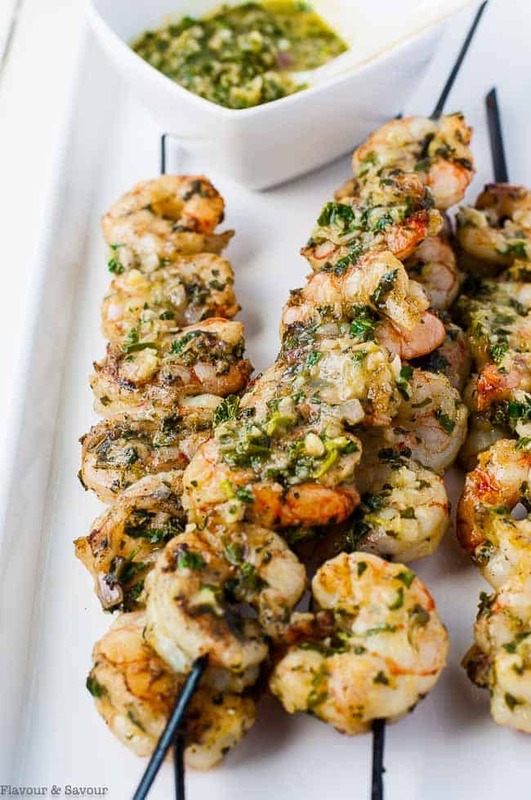 We love chimichurri, and yours looks delicious on these grilled shrimp skewers. These would be perfect to assemble ahead of time for summer entertaining. Thanks Colleen, Yes–you’re right. 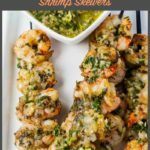 They would be easy to prepare ahead of time and pop on the grill at the last minute! Thanks for commenting! Thanks so much Denise! 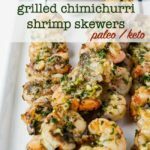 I’m planning on making Chimichurri Scallops soon, too! 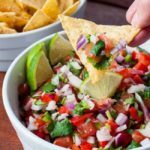 Chimichurri Sauce is SO easy and SO flavourful! Hope you get a chance to try it soon. It’s great on other grilled meats and veggies, too.